So what do you do with all the fake news that's spewing forth on social media these days? Well if you're David Byrne, you make a movie with it. That's what Byrne did back in 1986, while still a member of The Talking Heads. He took a bunch of twisted tabloid tales of the day and made them come to life in a little town in the middle of nowhere called Virgil, Texas. 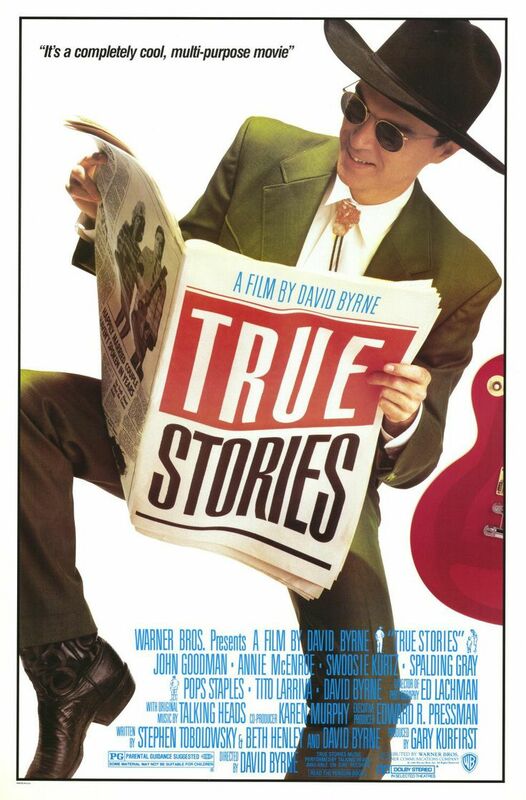 Aided by his band, and a handful of other musicians -- including Pops Staples and Tito Larriva -- and actors including John Goodman, Spalding Gray, Swoosie Kurtz, Annie McEnroe and Santa Fe's own Jo Harvey Allen -- Byrne's True Stories was, in my book, the most under-rated movie of the '80s. It was a commercial flop, but it's one that I keep going back to, each one uncovering a new secret I'd missed before. There is no real plot here, just wonderment. ... This movie does what some painters try to do: It recasts ordinary images into strange new shapes. There is hardly a moment in "True Stories" that doesn't seem everyday to anyone who has grown up in Middle America, and not a moment that doesn't seem haunted with secrets, evasions, loneliness, depravity or hidden joy - sometimes all at once. Byrne's Polaroids of Virgil become an accumulative portrait that hints at unease in the heartland. ... When Byrne shows us that glowing neon stage out in that eerie emptiness, or The Invisible Hospital of St. John the Baptist, a great voodoo altar to love, ... he also fixes in our minds a view of the country he is unwilling to see vanish. In this scene, featuring John Ingle, Byrne foresaw the rise of Alex Jones -- if Jones were backed by good music. Contemplate the "Puzzling Evidence." In that scene the choir's keyboard player was none other than Tito Larriva from the influential Chicano punk-rock band The Plugz (and later Cruzados and Tito & Tarantula) Here is Tito's big solo spot in True Stories, a song called "Radiohead," featuring Tejano music titan Steve Jordan on accordion. I heard a rumor that some overrated band in the '90s named themselves for this song. Pops Staples, known for his gospel and soul music with The Staples singers, appeared as a voodoo priest to invoke the trickster god Legba in this scene. John Goodman, as the lovelorn bachelor Louis "The Bear" was the star of True Stories. He wrote a little song that, with the help of Papa Legba, won the heart of his true love. (And he's not a bad country singer!) What good is freedom? God laughs at people like us. "I wrote 'Billie Jean.' And half of Elvis' songs."